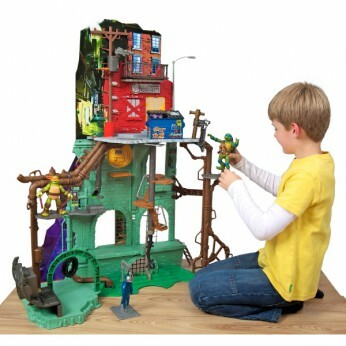 The ultimate playset for Teenage Mutant Ninja Turtle fans! The Secret Sewer Lair playset is enormous, and ready for Ninja battle action! Standing over 1m tall and resembling the Sewer Lair that is home to the Turtles in the TV show, the Secret Sewer Lair includes more than 20 different exciting Ninja features. Three different levels, in the sewer, street level and building top play. This toy costs approximately £89.99 (for the latest and best prices make sure you check our retailer list for the Turtles Secret Sewer Lair Playset above). In our review of Turtles Secret Sewer Lair Playset we classed it as being suitable for ages 3 years, 4 years, 5 years but recommend you check the manufacturer specific advice before purchasing.